A new Pew Research Center report shows that in the United States, the share of people aged 65 or older will rise dramatically by 2050. However, the U.S. isn’t experiencing the same gray wave that many other developed nations in Europe and Japan are. At least one-in-five people in Japan, Germany and Italy are already 65 or older, and most other European countries are close behind. In the U.S., 13% of the population is 65 or older, ranking the country 42nd on this measure out of about 200 other places in 2010, according to United Nations data. But thanks in large part to global increases in life expectancy, populations in all regions of the world are expected to age dramatically in the coming decades, according to the United Nations. Europe and North America will continue to lead this trend, with the largest shares of older people through the middle of the century. 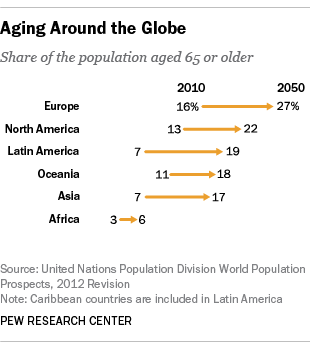 Currently, 16% of Europe is comprised of people 65 and older, as is 13% of North America. 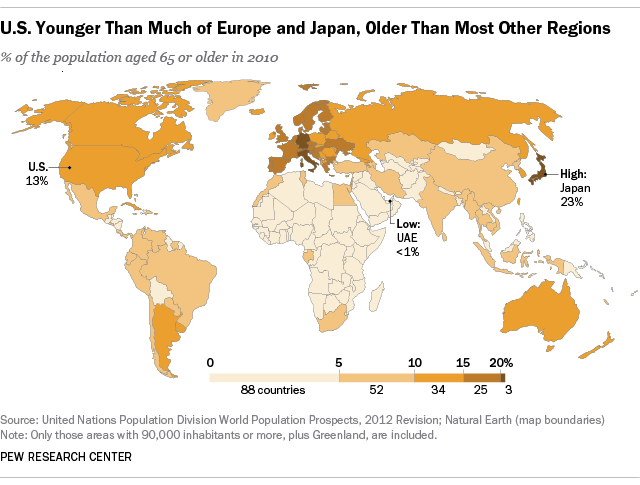 By 2050, one-fourth (27%) of Europe’s population will be at least 65 years old, as will 22% of North America’s. In Oceania, the share of older people is expected to rise from 11% to 18%. In other parts of the world, the share of the elderly population is still quite low, but it’s expected to rise dramatically. At present, just 7% of people in Latin America are aged 65 or older, but that number is expected to reach 19% by midcentury. Asia’s population is expected to undergo a similar transformation. Meanwhile, in Africa, the share of the population that is 65 or older is expected to double, rising to 6% – still relatively youthful, compared with the rest of the world. Global aging has policy implications for nations with social programs designed to support older adults. In the U.S. now, about 38% of income among older people comes from government transfers, according to the Organization for Economic Cooperation and Development. But what might the future hold, in terms of government support of older, retired people? The bulk of Americans who are still working are skeptical that they will receive Social Security benefits comparable to what today’s older people get, according to a new Pew Research Center survey. Fully 41% of those not yet retired expect that there will be no Social Security benefits for them when they reach retirement, and another 31% expect that there will still be enough money for benefits, but that they will be offered at reduced levels only. Just one-in-five expect that there will be enough money in the Social Security system to provide them with benefits equal to the benefits today’s retired people are given.